Bird Kingdom is the World’s Largest Free-Flying Indoor Aviary. This World Class Attraction is located a 5 minute Walk from Niagara Falls. (Open All Year) Encounter Exotic Birds, Animals and Reptiles as you search for the legendary Lost Kingdom. Imagine a journey in search of a legendary Lost Kingdom. Discover tropical birds and animals as you explore the pathways throughout the rainforest. An adventure that is fun for all ages! This incredible experience begins at the mysterious Old Museum where you feel like you have travelled back in time. The adventure continues at Bird Kingdom’s Animal Encounters as you meet friendly parrots and exotic animals. Explore the Night Jungle that is home to curious owls, bats and fascinating nocturnal creatures. At last, 'Discover The Kingdom'! Be amazed as you enter the World's Largest Indoor Aviary, where exotic colourful birds fly freely in the multi-level rainforest. Wander on the pathway that begins at the aviary’s top level, taking you behind the magnificent waterfall and down to the jungle floor. 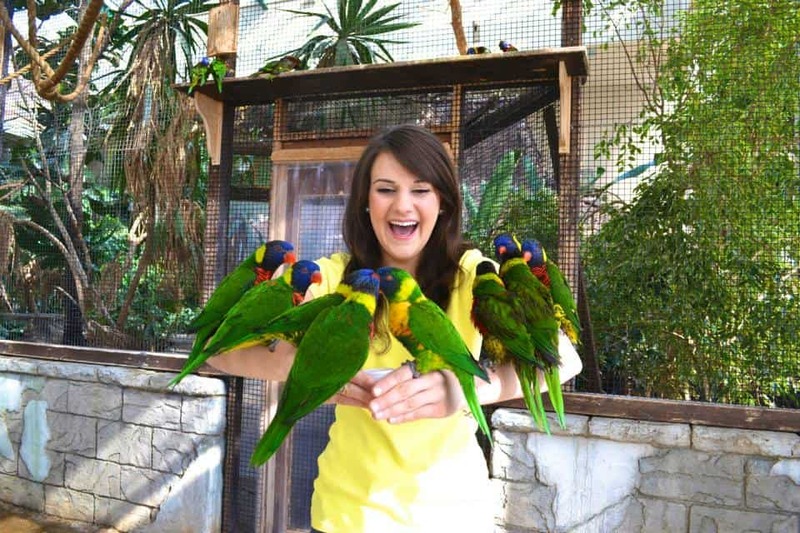 Lorikeet Landing provides an unforgettable experience where you can feed and interact with playful lorikeet birds. Within the jungle lies a rare Javanese House from the 1800s, the only one of it’s kind in all of North America. This architectural masterpiece is entirely hand carved solid teak and was incredibly constructed without nails. Bird Kingdom is proud to be included in the Trip Advisor Hall of Fame. For Individuals needing the assistance of a service dog/animal, Bird Kingdom will offer to keep your service dog/animal in a supervised office while you are on tour. There is no fee for this service. While Bird Kingdom recognizes the responsibility of ensuring reasonable access to all members of the public, due to the unique aspects of our free flight facilities and the sensitivity of the birds we must limit the access to service animals. Please contact our customer service line 905 356 8888 ext. 226 to plan your visit.